“Wake up, Monsieur le Comte! You have great things to do.” Those are the words, which, uttered by his personal valet every morning, would rouse the celebrated 19th century thinker, Henri de Saint Simon. But for most of us, struggling to wake up in time for school or work, or leaving home at daybreak to reach a far-away well, greatness is not the first thing on our minds. Overwhelmed by our daily struggles, some of us might not feel equipped to take on something as immense as the Sustainable Development Goals (SDGs) – 17 objectives to overcome some of the greatest challenges facing humanity today. The SDG Advocates – 17 exceptional personalities from the worlds of politics, economy, advocacy, sports and show business – see things differently. At the end of September, many of them attended the high-level week of the UN General Assembly and the SDG Media Zone, convincing everyone, from world leaders to youth activists, that we all have a role to play. These positive calls to action, uplifting as they are, are often drowned out by the narrative of hopelessness dominating the media. How can we remain hopeful with stories of climate change, extreme weather disasters and nuclear warfare making the headlines every day? “One of the things is to know that the good news won’t be at the front of the newspapers, but not to lose faith in the fact that it’s happening,” says Richard Curtis. “A good SDG Advocate is someone who understands how the Sustainable Development Goals are different from a ‘classic’ development strategy, who understands what happened on the 25th of September 2015 when the leaders adopted this shared vision for humanity,” adds Mr. Gass. 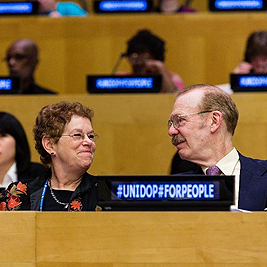 This year, older persons around the world are celebrating the United Nations International Day of Older Persons, by looking to the future and underscoring their vital role in it. 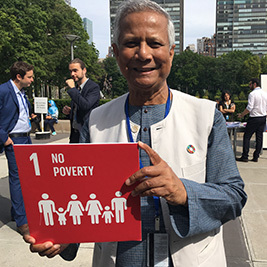 Today, there are 962 million older persons worldwide, who are projected to outnumber youth by 2030, the target date for the Sustainable Development Goals (SDGs). It is undeniable that global ageing has become a mega-trend that is clearly going to have a significant impact on the road to the achievement of the SDGs, which necessitates the inclusion of older persons and harnessing their untapped potential in the process. This year’s theme “Stepping into the Future: Tapping the Talents, Contributions and Participation of Older Persons in Society” is about enabling and expanding the contributions of older people in various aspects of social, cultural, economic and civic and political life, in accordance with older persons’ basic rights, needs and preferences. The official commemorative event will take place at UN Headquarters in New York on 5 October 2017 and is organized by the NGO Committee on Ageing in partnership with UN DESA Focal Point on Ageing, and sponsored by the Permanent Mission of Argentina. The event will include a panel discussion to showcase cutting-edge research, age-related technological innovations, and models of civic involvement and entrepreneurship of older persons. It will also feature the official launch of Highlights of the 2017 World Population Ageing report. The commemoration will be broadcasted live via UN Web TV. To follow the conversation via social media, the online audience is encouraged to use the hashtags #UNIDOP and #60Plus.